Liverpool are reported to have contacted super-agent Mino Raiola to help broker a potential summer deal for Napoli playmaker Lorenzo Insigne. Italian website La Repubblica, as quoted by Sport Witness, reported earlier in the week how Jurgen Klopp’s side had seen a massive €70million (£61m) bid for 56-goal Serie A sensation rejected in the January window. Klopp has still not replaced Philippe Coutinho, who moved to Barcelona last January, but the report claimed the Reds boss is still on the lookout for a No.10 and, having seen a bid for Nabil Fekir break down last summer, has now placed the talismanic Napoli star as his top target. But with Liverpool’s approach for Insigne rejected, it’s now reported that the Reds have left their bid for the player on the table and are willing to return again – possibly with an increased bid – for the 27-year-old this summer. However, it seems Klopp is not be dissuaded easily and has retained his interest in Insigne despite his initial setback. Furthermore, La Repubblica now claims the Reds have spoken with super-agent Raiola to help broker the deal for Insigne and will try grease the wheels by dealing through the Italian-Dutchman as opposed Napoli themselves. That’s because, in the paper’s words, Liverpool’s approach has been rejected out of hand by no-nonsense Napoli chairman Aurelio de Laurentiis, having reportedly informed Insigne’s representatives that Liverpool would have to double their offer to have any hope of signing the player. 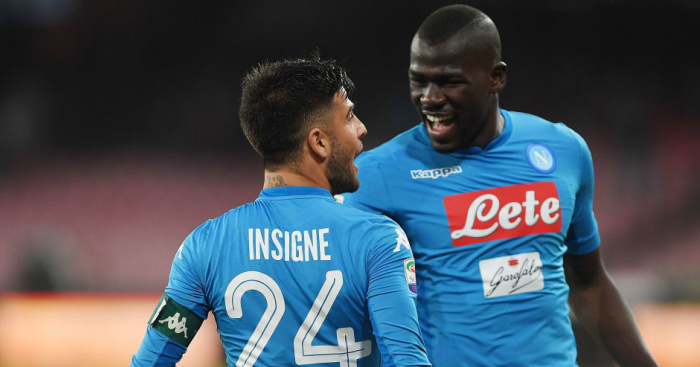 But the Reds will hope Raiola can talk Napoli into a potential sale – that inspite of ongoing talk that the club could lose star defender Kalidou Koulibaly this summer too. Insigne was the man who sunk Liverpool with a last-gasp winner when Napoli defeated Klopp’s men 1-0 in the Champions League. The forward has scored 11 times in all competitions this season, and has 56 goals and 55 assists in 224 Serie A appearances for the Naples-based side. The post Liverpool get Raiola involved as Klopp makes stance clear on £61m target appeared first on teamtalk.com.